When I draw this card for others, I have a bit of an “ahhh…” factor that comes into play, and have no problem translating. This is one of those cards that usually provokes tears from those who draw it – healing tears, mind you – but tears nonetheless. In life, we create many versions of ourselves. I, for example, am mother, daughter, sister, mystic, waitress, friend. In addition to the roles I’ve taken on as various personas, there are also past versions of me that still exist – There’s the me that existed at age 9 when I was touched inappropriately and abused in various fashions. There’s the me at fifteen who was lost in her own arrogance and about to become a mother. There’s the me at twenty-three who tended bar in daisy dukes and gambled, drank, or smoked away her troubles. There’s the me at age thirty who made such bad choices that it caused the disruption of my family. In present day, there’s the me who struggles to be a good mother, the me who must be the provider, the me that hungers to be savagely WOMAN. There are all these different aspects of me – most of whom I resent or am angry with for their failures and consequences, if not for their lost hopes and dreams. This card says it’s time for Unity. It’s time to bring together all the pieces and parts of Self, forgive past mistakes, let go of grudges, UNIFY, and become one WHOLE being who doesn’t self depreciate. It’s time to stop being such a harsh judge of self, to stop fearing the judgment of others, and to be true to me. The card being inverted today clues me in that I’ve been resisting this merger. Card 20 also stands for the feelings that come with salvation. When the angel calls, you are reborn – cleansed of all guilts and burdens. The past and its mistakes are behind you, and you are ready to begin anew. You may even feel a calling – a personal conviction of what you are meant to do. If you are in a low period, in need of hope and absolution, Judgement can show you that renewal is at hand. The Angel hands the Fool a small trumpet. The Fool is hesitant, but he knows that this is a final decision. Either to go forward, or stay where he is. He blows, and the trumpet’s song echoes across the sky, its vibrations seeming to crack open the Earth. From under the Fool’s feet, memories rise. Images of his innocent youth, challenges, loves, failures, losses, success, disillusionment and wisdom. With Fire as its ruling element (or Pluto as its ruling planet), Judgement is about rebirth, resurrection. The idea of Judgement day is that the dead rise, their sins are forgiven, and they move onto heaven. 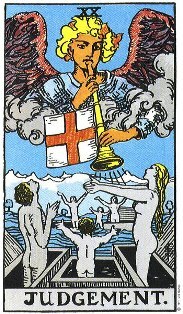 The Judgement card is similar, it asks for the resurrection to summon the past, forgive it, and let it go. There are wounds from the past that we never let heal, sins we’ve committed that we refuse to forgive, bad habits we haven’t the courage to lose. Judgement advises us to finally face these, recognize that the past is past, and put them to rest, absolutely and irrevocably. This is also a card of healing, quite literally from an accident or illness, as well as a card signaling great transformation, renewal, change. Judgement is often a hard card to read; it usually signals just a big change, one that involves leaving something old completely behind and stepping into something completely new. Like closing the door on an old job, and opening the door to a new and very different career. But it’s also about making a final decision, to take that plunge into the new career, to forgive your family, to leave an abusive spouse, to make a new life. To heal and renew. It’s a very hard card to read, in part because it deals with very hard and final decisions. And it means facing something that most Querents don’t want to face. You can’t hide any longer, this card says, all the dead have risen and are out in the open. Face what you have to face; make that decision. Change. Considering July’s reading and my writings of last night, I’d say this card is right on time… and while it didn’t bring me to tears (yet), it did raise the hairs on my arms and give me a major case of the chillie willies.